Thanks for all the updates, 9darlingcalvi, but I'm not sure whats going on with posting all the 'ideas' for new tanks and very little follow through. We enjoy hearing folks discuss new tank ideas and following the progress of new setups. But you probably don't have to start a new thread each time. Just keep one going that we can chime in on when you have questions....even if it is different tank sizes, or ideas for stocking. I think you could get a lot of quality results if you ask questions once you get something going rather than multiple posts about ideas that never really come to fruition. In this instance, we cannot discuss the housing and care of a betta--but I'm sure you already know that. Just go with you gut, and set something up. 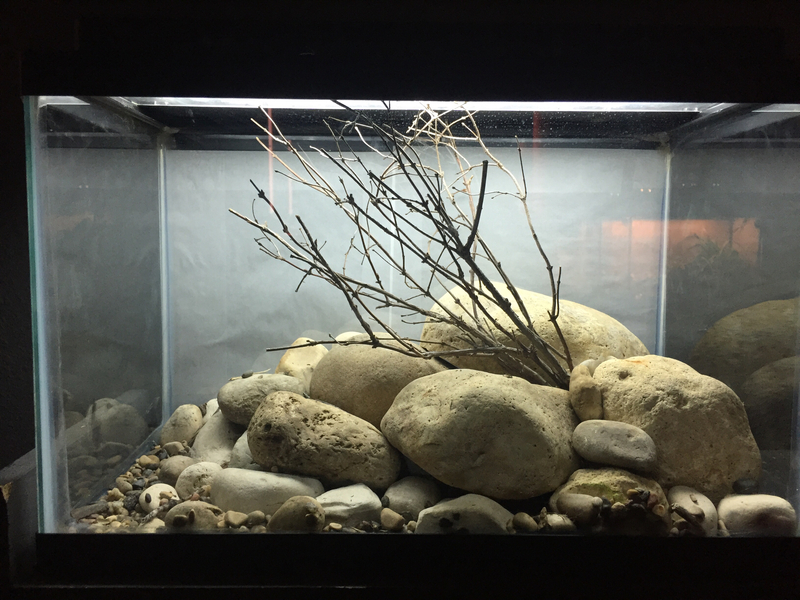 Keep us posted as to how the tank progresses, and your successes/failures. That's how a lot of us got where we are with fish keeping. You seem to be an avid fishkeeper and full of enthusiasm. There are just a lot of posts going that there is little room for us to comment on. I personally don't feel comfortable keeping fish in anything smaller than 10 gallons. I only use 5.5s for invertebrates. It's a tiny, tiny amount of space. I agree for the most part on a 5 gallon. I suppose you can keep a fish in it and a small sponge filter. Maybe even two darters if you feel like they are comfortable. But more than a single stickleback would be a waste as you would still only have a single stickleback in a couple days. There can be only one. 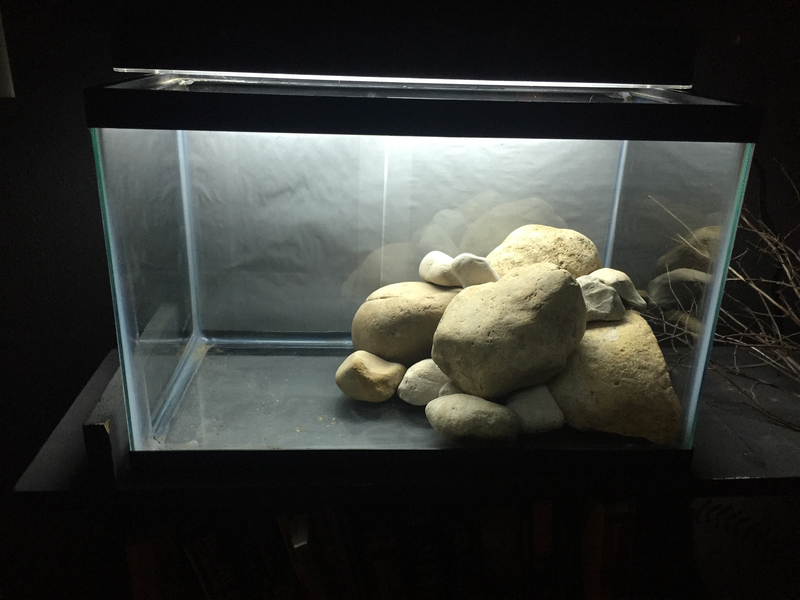 What does a new 10 gallon cost? $10? Often a loss leader at larger pet stores. That is like a medium pizza. Could a stickleback go with a darter or is that just death waiting to happen. Also my parents won't let me get anew fish tank, I've tried to get a new one they won't let me. Even if it's a pair of sticklebacks I could only have one? Dang! Maybe then just a pair of johnnies and ghost shrimp. To be honest, in my experience, you can't keep sticklebacks with anything. Even worse in a small tank. In a tank this small I don't believe more than one stickleback would survive. Very few keep them because they are so aggressive. The Johnny darters will be a much better choice. Sorry, this is going to sound harsh, but it's important to say. I can't fit a 2000 gallon tank in my house: that doesn't mean I'm going to try and stuff an orca in my 30 gallon. If you can't have the right tank, then you can't have the fish. I have two 5 gallon planted shrimp tanks that I absolutely adore. Perhaps you could try that instead. There can be only one. What does a new 10 gallon cost? $10? They cost less than a 5.5 gallon at the store near me! Most people I know give away 10 gallon tanks. Wait until you move to your dorm to get fish and get a free 10 gallon tank off of Craigslist. If you're sticking with the 5.5 may I suggest a crayfish? That setup looks perfect for one. Better yet, ask someone for a 10 gallon tank. If you know people who keep fish (or know people who know people who do) put the word out that you're willing to home a castoff 10G. Keep an eye on the local Craigslistings and you'll probably be able to spot some freebies, or a 20G for less than the retail price of a 10G. A 5.5G is what most fishkeepers would consider barely adequate for a relatively hardy and territorial fish like a betta, and many draw the line at 10G for any kind of fish. A tiny shrimp colony (I wouldn't count ghost shrimp) or a dwarf crayfish and a handful of snails are about all a 5.5G will harbor safely. Actually, setting up your tank for hardy shrimp or dwarf crays is probably invaluable practice. 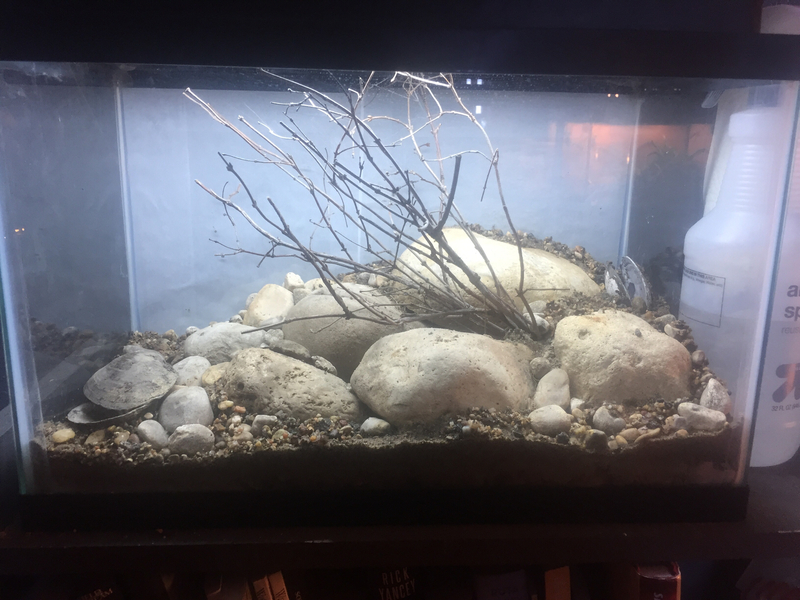 Better still if you decide to throw in some greenery and put a desk lamp with a daylight CFL bulb over the tank so that the tiny water volume gets somewhat purified by the plants. Even a few bits of Java Fern, some rocks covered with Java Moss, and a layer of floaters like duckweed would go a long way for water quality. There are native alternatives for those tropical plants, too. Tiny tanks experience more rapid chemistry fluctuations because the volumes involved are much smaller than you'd expect compared to larger tanks. I managed to get my 56 gallon tank for the cost of driving over, emptying it, and hauling it back. It was listed on CL, but I first heard about it through a coworker. It's definitely possible to take a good tank off someone's hands gratis if you keep your ear to the ground and your eyes open. Again, putting out feelers and letting it get around that you're in the market for a second-hand tank is also invaluable. Ghost shrimp are awesome. They will really appreciate some Java moss or a Marimo ball or just native hair algae if you don't mind the look of it. Yeah, kind of a bummer with your only resource being a 5.5. Have you looked at densities of aquacultured fish? If you have a good filter, some plants, and a test kit to monitor when water changes are needed, I believe you can keep more than one darter in that space. You could probably keep 4 in there healthy without a ridiculous amount of water changes. It would be up to you to decide what was comfortable. At least you are being reasonable, people have asked how many bass they can keep in a 30, smaller even. So start with one darter, add another. If you think things are getting stressful with two then stop. In the aquaculture world, a pound of fish per 10 gallons is not fully stocked. I do not suggest striving for a density like that, just saying that you can try whatever you want as long as you have some sense.